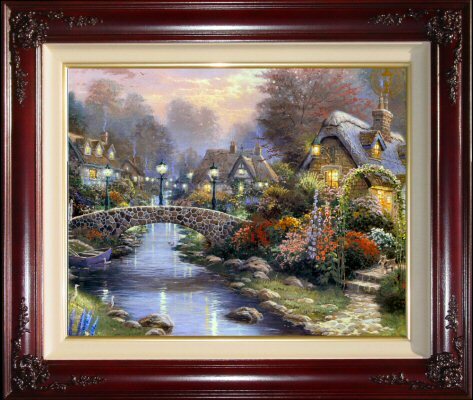 Lamplight Bridge is the fifth painting in Thomas Kinkade's popular Lamplight Lane series. ++++Tom released this painting in 1996. ++++ Rare! This Edition is LIMITED to ONLY 295 in the world! 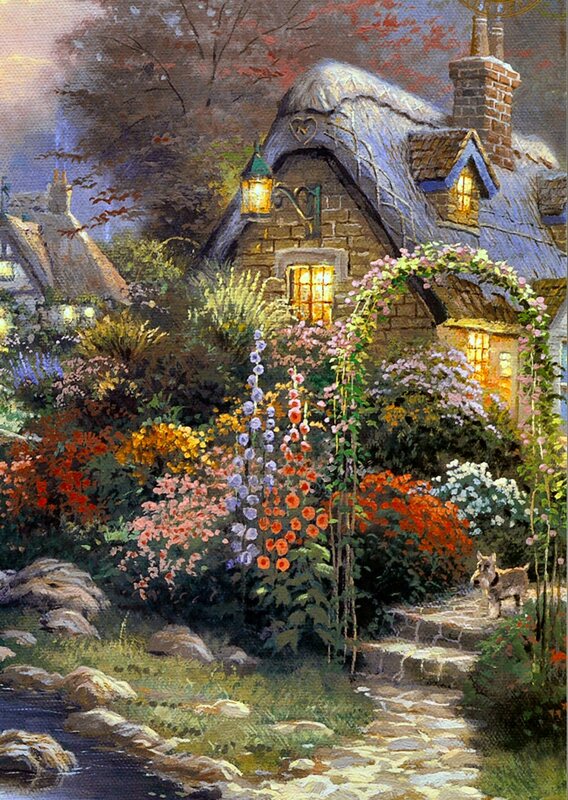 ++++ Brass Plaque with the legend "Lamplight Bridge ~~ Thomas Kinkade"
++++ Theme: Country Village, luminescent cottages, gardens, smoking chimneys, winding pathway. 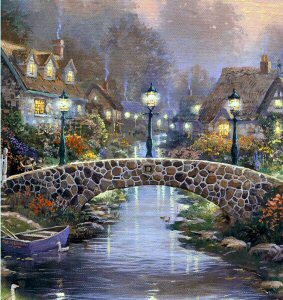 "As we float down the Brooke Windermer, a quaint stone footbridge glimmers in distant lamplight, and we appreciate anew the special quality of this romantic light. The electric light of our century is cold and hard; it produces clean, crisp shadows, In contrast, Victorian lamplight was warm and soft; in its flickering flame blurred shadows danced like leaves in the wind. Lamplight Bridge, the fifth stop along our imaginary brooke that flows through the English Cotswolds, is enlivened by the vibrant glitter of gas lamps. The ancient stone span, crowned by lampposts, invites evening walkers. The bridge links neighbors who dwell on either side of the stream; it enhances the cozy hospitality of English country living. You'll notice, as well, a rustic gate with overgrown trellis that leads form the near cottage down to the banks of our gentle stream. 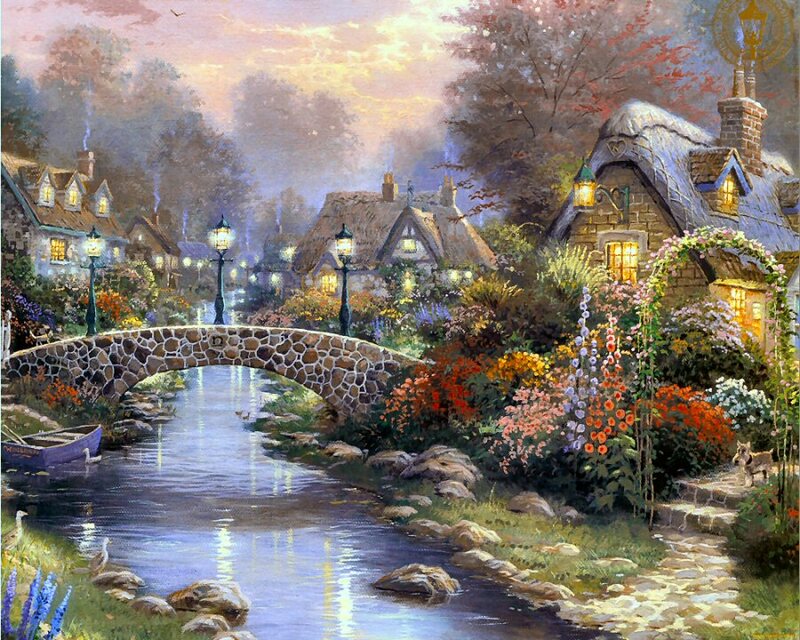 Such a romantic path is an irresistible invitation to all those who are young at heart. Perhaps you and I and all who delight in the charms of Lamplight Bridge can join the village children in sailing our wooden boats on the brooke."